Has anyone installed the Jiayou New Energy H7 LED Headlight Bulb? Re: Has anyone installed the Jiayou New Energy H7 LED Headlight Bulb? I have them in both Hi and Low, working great with no errors. With them on, I ride with them on Hi and they are bright as reported by bikes ahead of me. I just returned from the i-BMW rally in Bardstown, KY and per day rides were >6hrs. No problem with these LEDs so far. Thanks for the info...was installation all plug and play or did you have to splice wires...and did you have to order the Tomall cover? 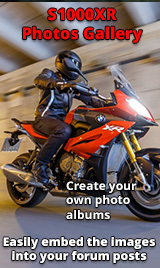 Tried to find the specific thread on i-BMW but just found this one "What accessories for the SXR" . Is that the one you were referring to? PNPlay. You do need the tomall covers, buy the 70mm ones. The 65 are too tight and I am afraid they my not stay too long. I have mentioned the thread in parenthesis in my previous post.